CBRS technology doesn’t need spikey shoes to gain traction on the fairways, if early results from technology tests undertaken by the PGA Tour at courses around the country are any indication. 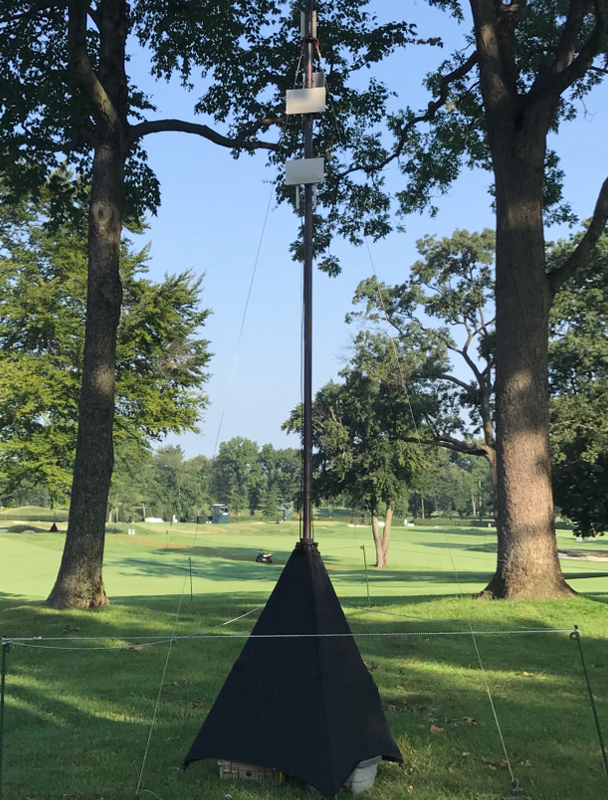 A recent 14-state test run by the top professional U.S. golf tour tapped the newly designated Citizens Broadband Radio Service (CBRS), which comprises 150 MHz of spectrum in the 3.5 GHz band. Golf courses, which typically lack the dense wireless coverage of more populated urban areas, are easily maxed out when thousands of fans show up on a sunny weekend to trail top-ranked players like Brooks Koepka, Rory McIlroy or perennial favorite Tiger Woods. To cover the bandwidth needs of tournaments, the PGA Tour has over time used a mix of technologies, many portable in nature given the short stay of a tournament at any given course. Like Wi-Fi or temporary cellular infrastructures used in the past, the hope is that CBRS will help support public safety, scoring and broadcast applications required to keep its events operating smoothly and safely, according to the PGA Tour. 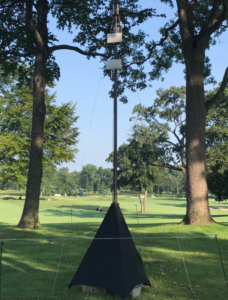 “We’re looking at replacing our 5 GHz Wi-Fi solution with CBRS so we can have more control over service levels,” said Steve Evans, senior vice president of information systems for the PGA Tour. Unlike 5 GHz Wi-Fi, CBRS is licensed spectrum and less prone to interference the Tour occasionally experienced. CBRS will also make a big difference with the Tour’s ShotLink system, a wireless data collection system used by the PGA Tour that gathers data on every shot made during competition play – distance, speed and other scoring data. The preliminary results are so encouraging that the Tour is also looking to CBRS to carry some of its own voice traffic and has already done some testing there. “We need to have voice outside the field of play, and we think CBRS can help solve that problem,” Evans added. But as an emerging technology, it’s important to acknowledge the limitations of CBRS. Compatible handsets aren’t widely available; the PGA Tour has been testing CBRS prototypes from Essential. Those units only operate in CBRS bands 42 and 43; a third, band 48, is expected to be added by device makers sometime in the first half of 2019. 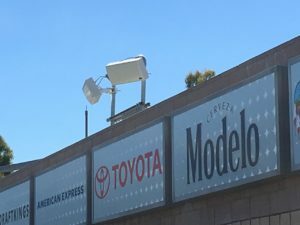 Kings are testing it at Golden 1 Center with Ruckus; NASCAR has been testing video transmission from inside cars using CBRS along with Nokia and Google, and the ISM Raceway in Phoenix, Ariz., recently launched a live CBRS network that it is currently using for backhaul to remote parking lot Wi-Fi hotspots. Outside of sports and entertainment, FedEx, the Port of Los Angeles and General Electric are jointly testing CBRS in Southern California. Love Field Airport in Dallas is working with Boingo and Ruckus in a CBRS trial; service provider Pavlov Media is testing CBRS near the University of Illinois Champaign-Urbana with Ruckus gear. Multiple service providers from telecom, cable and wireless are also testing the emerging technology’s potential all around the country. Editor’s note: This profile is from our latest STADIUM TECH REPORT, an in-depth look at successful deployments of stadium technology. Included with this report is a profile of the new game-day digital fan engagement strategy at Texas A&M, as well as a profile of Wi-Fi at Merceds-Benz Stadium, home of Super Bowl LIII in Atlanta! DOWNLOAD YOUR FREE COPY now! CBRS has undergone a 6-year gestation period; 150 MHz worth of bandwidth was culled from the 3.5 GHz spectrum, which must be shared (and not interfere) with U.S. government radar operations already operating in that same spectrum. From a regulatory perspective, CBRS’s experimental status is expected to give way to full commercial availability in the near future. Consequently, wireless equipment vendors have been busy building – and marketing – CBRS access points and antennas for test and commercial usage. 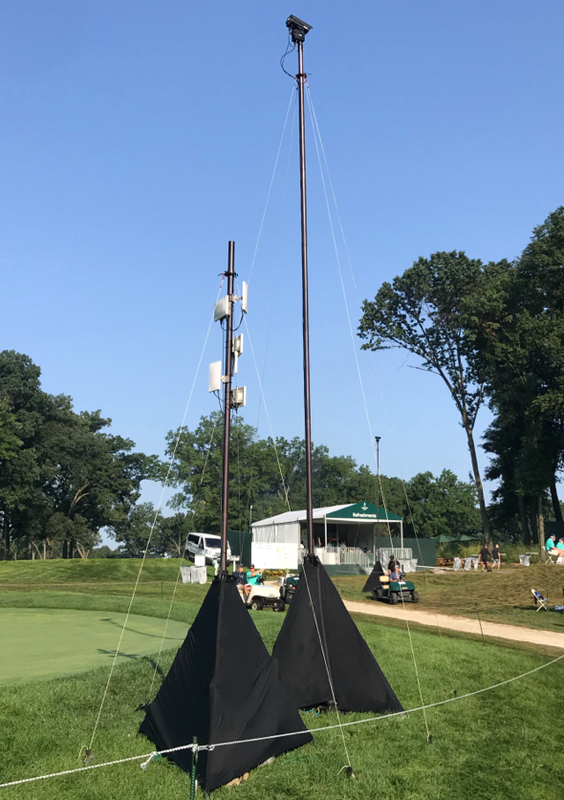 But entities like the PGA Tour have already identified the benefits and aren’t waiting for the FCC to confer full commercial status on the emerging wireless technology. Congress Americas meeting in Los Angeles. More than 20 organizations – all part of the CBRS Alliance – exhibited their trademarked OnGo services, equipment and software in a day-long showcase event. (Editor’s note: “OnGo” is the alliance’s attempt to “brand” the service as something more marketable than the geeky CBRS acronym). • Enterprise and industrial applications: extending or amplifying wireless in business parks and remote locations; Internet of Things data acquisition. • Neutral host capabilities, which some have likened to LTE roaming, an important development as 5G cellular services ramp up. Previously, if customers wanted to extend cell coverage inside a building or a stadium, their best option was often distributed antenna systems (DAS). But DAS is complicated, expensive and relies on carrier participation, according to Wright. “Carriers also want to make sure your use of their spectrum doesn’t interfere with their macro spectrum nearby,” he added. CBRS uses discrete spectrum not owned by a mobile operator, allowing an NFL franchise, for example, to buy CBRS radios and deploy them around the stadium, exclusively or shared, depending on their requirements and budgets. On a neutral host network, a mobile device would query the LTE network to see which operations are supported. The device would then exchange credentials with the mobile carriers – CBRS and cellular – then permissions are granted, the user is authenticated, and their usage info gets passed back to the carrier, Wright explained. 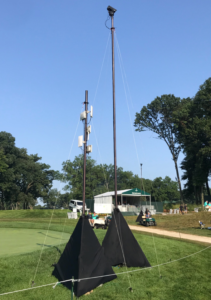 With the PGA Tour tests, the Essential CBRS devices get provisioned on the network, then connect to the CBRS network just like a cell phone connects to public LTE, Evans explained. The Tour’s custom apps send collected data back to the Tour’s network via the CBRS access point, which is connected to temporary fiber the Tour installs. And while some of Ruckus’s CBRS access points also support Wi-Fi, the Tour uses only the CBRS. “When we’re testing, we’re not turning Wi-Fi on if it’s there,” Evans clarified. While the idea of “private LTE” networks supported by CBRS is gaining lots of headline time, current deployments would require a new SIM card for any devices wanting to use the private CBRS network, something that may slow down deployments until programmable SIM cards move from good idea to reality. But CBRS networks could also be used for local backhaul, using Wi-Fi to connect to client devices, a tactic currently being used at ISM Raceway in Phoenix. 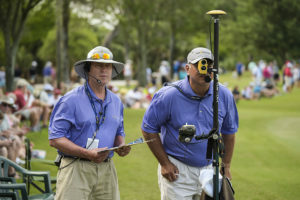 Prior to deploying CBRS access points at a location, the PGA Tour surveys the tournament course to create a digital image of every hole, along with other data to calculate exact locations and distances between any two coordinates, like the tee box and the player’s first shot or the shot location and the location of the hole. The survey also helps the Tour decide how and where to place APs on the course. Courses tend to be designed in two different ways, according to the PGA Tour’s Evans. With some courses, the majority number of holes are adjacent to each other and create a more compact course; other courses are routed through neighborhoods and may snake around, end-to-end. “In the adjacent model, which is 70 percent of the courses we play, we can usually cover the property with about 10 access points,” Evans explained. Adjacent-style courses where the PGA Tour has tested CBRS include Ridgewood Country Club in Paramus, N.J.; Aronimink Golf Club in Newtown Square, Penn. ; and East Lake Golf Club in Atlanta. In the second model, where the holes are strung back to back, the PGA Tour may have to deploy as many as 18 or 20 APs to get the coverage and throughput it needs. That’s the configuration used during a recent tournament at the TPC Summerlin course in Las Vegas, Nev., Evans told Mobile Sports Report. On the course, CBRS APs get attached to some kind of structure where possible, Evans added. “Where that doesn’t make sense, we have portable masts we use – a tripod with a pole that goes up 20 feet,” he said. The only reason he’d relocate an AP once a tournament began is if it caused a problem with the competition or fan egress. “We’re pretty skilled at avoiding those issues,” he said. 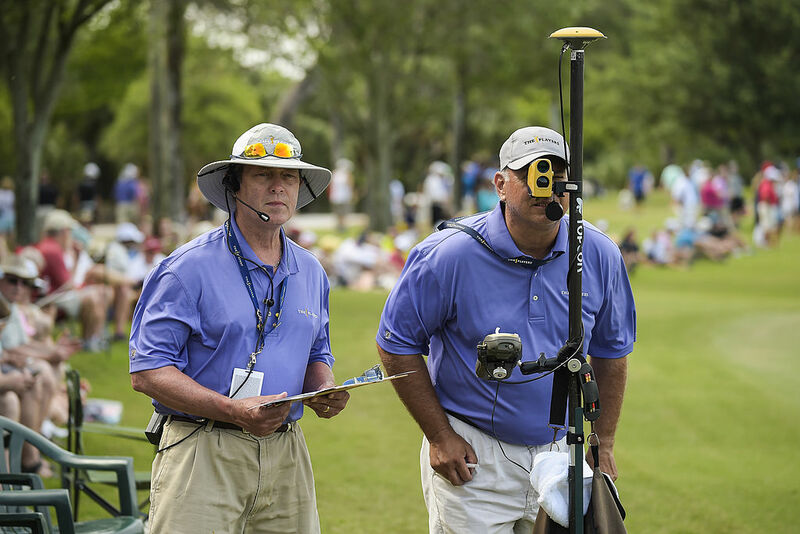 A handful of PGA Tour employees operates its ShotLink system, which also relies on an army of volunteers – as many as 350 at each tournament – who help with data collection and score updates (that leader board doesn’t refresh itself!). “There’s a walker with each group, recording data about each shot. There’s technology for us on each fairway and green, and even in the ball itself, as the ball hits the green and as player hits putts,” said Evans. The walker-volunteers relay their data back to a central repository; from there, ShotLink data then gets sent to PGA Tour management and is picked up by a variety of organizations from onsite TV broadcast partners; the pgatour.com Website; players, coaches and caddies; print media; and mobile devices. In addition to pushing PGA Tour voice traffic over on to CBRS, the organization is also looking for the technology to handle broadcast video. “We think broadcast video capture could become a [CBRS] feature,” Evans said. The current transport method, UHF video, is a low-latency way to get video back to a truck where it can be uploaded for broadcast audiences. A broadcast program produced by the organization, PGA Tour Live, follows two groups on the course; each group has four cameras and producers cut between each group and each camera. That video needs to be low latency, high reliability, but is expensive due to UHF transmission. Mention StubHub Center to your average sports fan in southern California and they’ll likely assume you’re talking about soccer’s LA Galaxy or the Los Angeles Chargers, the recently relocated NFL franchise subletting space while its permanent stadium gets built. But StubHub Center, built on the campus of California State University/Dominguez Hills, also includes a velodrome, an 8,000-seat tennis stadium (with several adjacent courts), and an outdoor track and field facility. Throw in the far-flung parking lots and it adds up to 125 acres that all need wireless connectivity. With such wide spaces to cover, StubHub management opted not to spend on fan-facing Wi-Fi and instead focused on distributed antenna system (DAS) technology to keep fans and tailgaters connected. 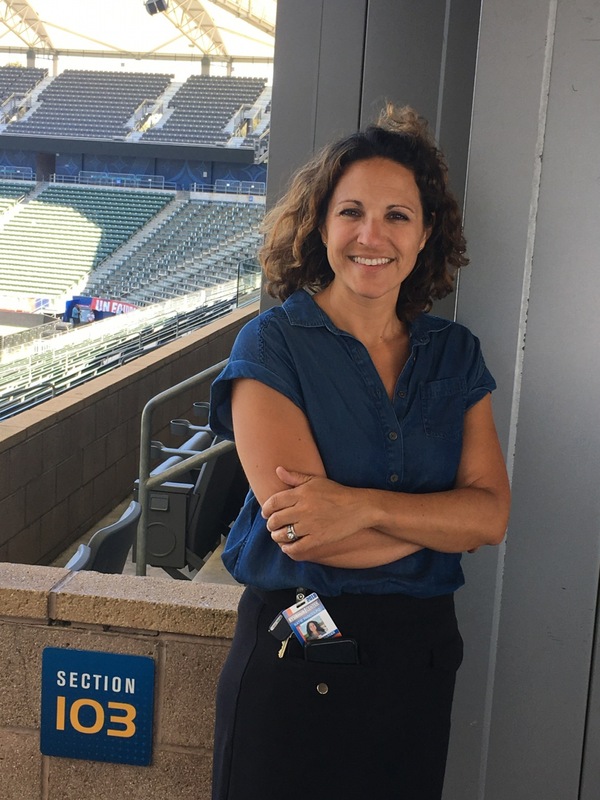 Katie Pandolfo, StubHub’s general manager, looked to the major cellular carriers to invest in and support the connectivity needs of Galaxy and Chargers fans, and other eventgoers at the open-air StubHub. Editor’s note: This profile is from our latest STADIUM TECH REPORT, an in-depth look at successful deployments of stadium technology. 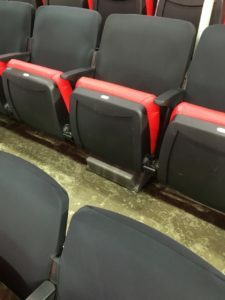 Included with this report is a profile of Wi-Fi at Nebraska’s Memorial Stadium, a sneak peek at Milwaukee’s new Fiserv Forum, and a profile of the new Wi-Fi network being added to Wrigley Field! DOWNLOAD YOUR FREE COPY now! “With our DAS-only approach, the investment is 100 percent on the carriers and doesn’t cost us anything,” Pandolfo told Mobile Sports Report. While they got a few complaints about no public Wi-Fi during events in 2017, when the 29-zone DAS system was activated, fans quickly acclimated and now use bandwidth from Sprint, T-Mobile and Verizon on the shared network. AT&T isn’t part of the DAS system, but has operated a macro site at StubHub for years, according to Pandolfo. 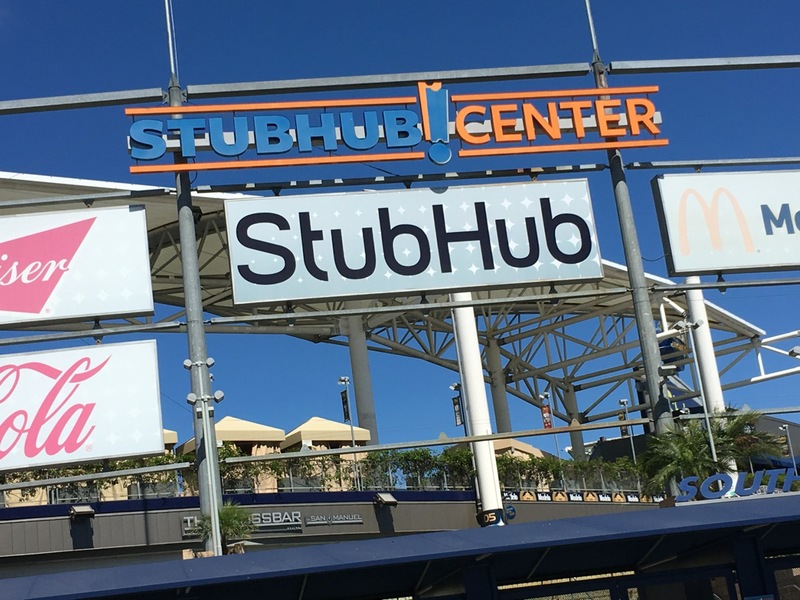 Mobilitie helped build StubHub’s DAS system and offered its engineering expertise; the turnkey provider also manages the system. The DAS-only approach is common in southern California; in addition to the Rose Bowl in Pasadena, the Honda Center in Anaheim and Viejas Arena (under construction) at San Diego State University are also DAS-only venues with no fan-facing Wi-Fi. StubHub Center, located in Carson, Calif., is 17 miles south of downtown Los Angeles, and upwind from a nearby Goodyear blimp mooring station; gusty coastal winds apparently make this a good training ground for new blimp pilots. The 27,000-seat StubHub originally opened in 2003 as Home Depot Center; the new sponsor came onboard in 2013. Anschutz Entertainment Group owns and operates StubHub Center. StubHub will handle several events when Los Angeles hosts the Summer Olympics in 2028, including bicycle track racing, field hockey, pentathlon, rugby and tennis. 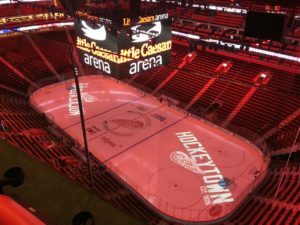 Pandolfo expects firmer plans for the venue’s technology needs to emerge sometime in the next couple years. Technology – especially wireless technology – will change a lot in that time, she noted. As the second soccer-specific stadium built in the U.S., Major League Soccer’s LA Galaxy is the venue’s premier tenant. But in 2017 when the National Football League’s Chargers moved from San Diego to Los Angeles, the facility underwent some major upgrades. 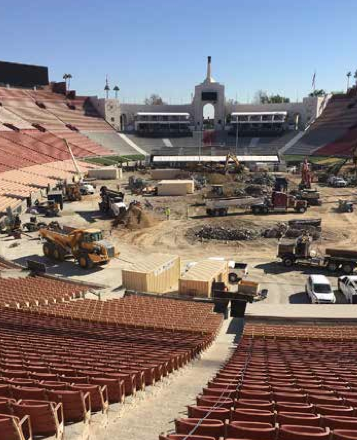 Additions include 1,000 new tip-up seats replacing bleachers on the east side of the stadium; another 330 bleacher seats were added in StubHub’s southeast corner. Luxury suites and the press box were renovated along with two new radio booths; they also added a security office for police and NFL officials, and camera booths at the two 20-yard lines and at the 50-yard line. Locker rooms were enlarged as was the press conference room. 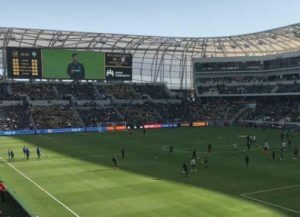 And tempting as it may be to lump all fans of any sport into a single heap, Pandolfo said Galaxy fans and Chargers fans behave very differently at StubHub Center. Chargers fans like to get up and walk around, visit concessions and take advantage of the venue’s amenities during the game. Not so for Galaxy fans, who tend to stay seated and don’t want to miss any of the action, she explained. 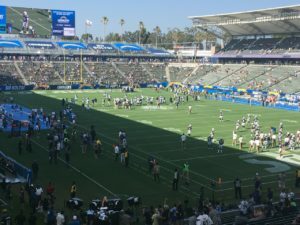 California’s Department of Alcoholic Beverage Control also just changed its rules and will now allow beer sales up and down the aisles of stadiums like StubHub Center. Beer hawking, she noted, didn’t used to be digital and required fans to pay cash. “Now it’s a quicker transaction that improves the fan experience,” using mobile pay systems or credit cards, Pandolfo said. In the meantime, Mobilitie continues to optimize StubHub’s DAS system; based on bandwidth speed tests conducted by Mobile Sports Report, things are moving in the right direction. 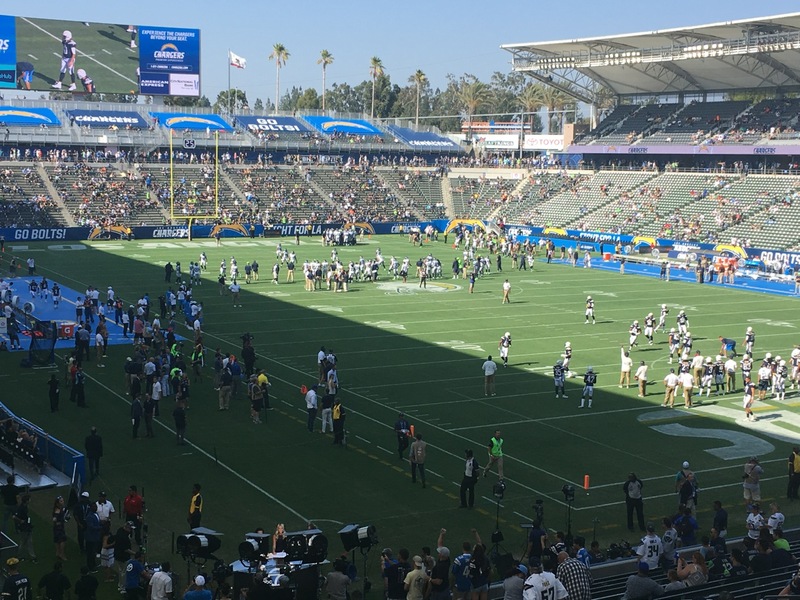 MSR tested Verizon DAS connectivity right after the system was installed in August 2017, and a year later during a Chargers’ pre-season game against New Orleans. In 2017, Verizon’s DAS struggled in single-digit Mbps uploads and downloads; quite often, the throughput was even less. What a difference a year makes. Mobilitie engineers’ fine-tuning has paid off; August 2018 tests show dramatic improvement, with the highest throughputs near the stadium’s northwest concessions area — 111.39 Mbps/12.15 Mbps (download/upload). A year previous, things were a lot more sluggish with 0.95 Mbps/0.04 Mbps speeds recorded in the same area. DAS performance has also improved just inside the gates past the ticket scanners at the bottom of the stairs; in 2017, we clocked only 1.87 Mbps/13.42 Mbps, but more recently throughput had jumped to 87.08 Mbps/21.42 Mbps. The concession area on the east side of the stadium checked in most recently at 76.55 Mbps/6.7 Mbps, another sizeable increase from last year when Verizon DAS throughput was a pokey 0.4 Mbps/0.06 Mbps. Speeds inside the stadium have also improved year-over-year. Section 230 in the northeast corner of StubHub measured 2.83 Mbps/1.96 Mbps a year ago, but were up to 13.48 Mbps/8.71 Mbps in August 2018. Similarly, the sunny northern end of the stadium above the end zone delivered 0.21 Mbps/0.27 Mbps a year ago, but jumped to a more acceptable 16.44 Mbps/18.27 Mbps. The east side of the stadium is also more robust; a year ago, bandwidth tests yielded 3.1 Mbps/0.01 Mbps, but were up to 8.97 Mbps/1.74 Mbps. 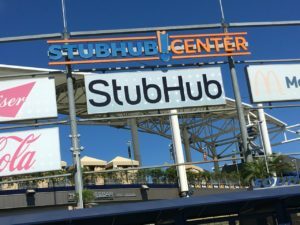 Improvements to the DAS network performance can only help improve the fan experience at StubHub Center. 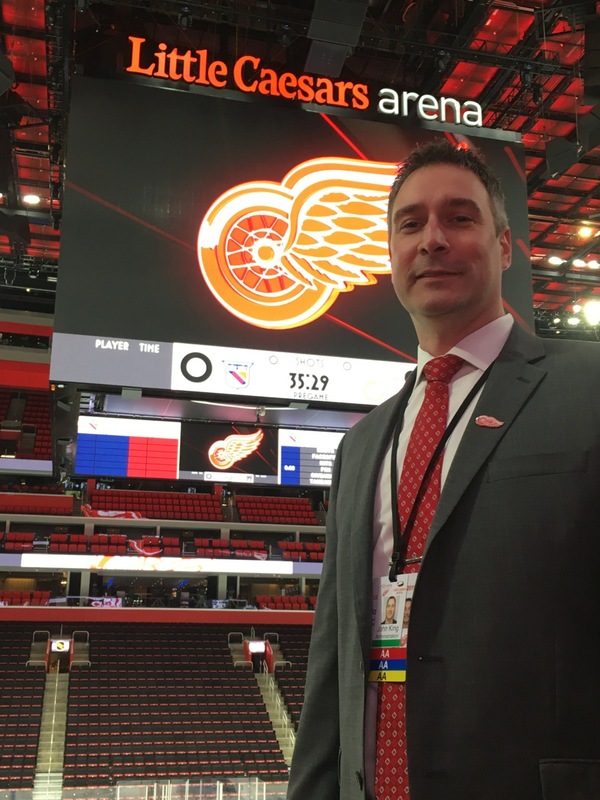 Pandolfo wants fans to be able to do everything faster: Get parked faster, enter the stadium, and take advantage of all the food, drink and merchandise options. “We look at the whole package and then at the network we have to provide to make that happen,” she said. “We’re looking at it from the fan experience but also how to optimize revenue for the building.” It’s the right formula for sporting venues compelled to balance technology requirements against dollars and cents. There’s an elegance to the advancing striker – the foot work, feints, arc of the kick – as they target the opponent’s goal. 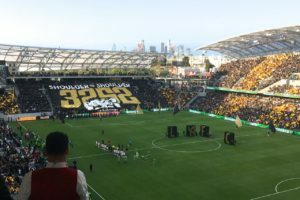 For the Los Angeles Football Club, that elegance gets reflected back in its newly christened home field, Banc of California Stadium, with its graceful lines and minimalist design, plus visibility and a connection to the field rivaling venues half its size. Opened in April, LAFC’s gleaming new stadium sits adjacent to the Los Angeles Coliseum (home to USC football, and to the NFL’s Rams, at least for now), replacing what used to be the Los Angeles Sports Arena. 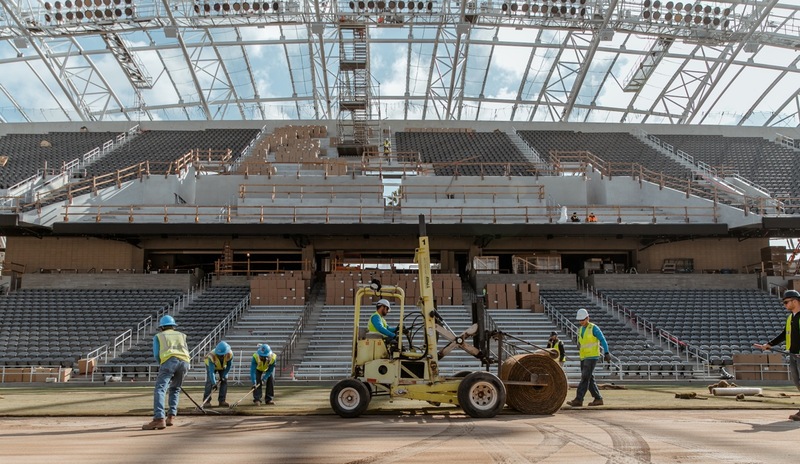 That structure was demolished in early 2016 and LAFC’s lengthy list of owners (Peter Guber, Magic Johnson, Will Ferrell and Mia Hamm, to name just a few of the sports and entertainment luminaries with a stake in the team) set the timer for April 29, 2018, LAFC’s first home game for its inaugural season. 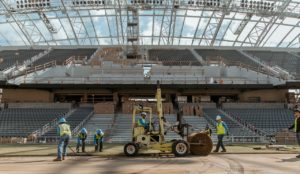 Construction crews worked relentlessly to meet the deadline; the venue was ready one month early, thanks to good planning and construction crews putting in 16-hour days to be ready for BofC Stadium’s debut. On April 29, the gates opened and a new era had begun with the ‘hat trick’ of a fiber backbone, solid wireless coverage and an advanced app strategy. Editor’s note: This profile is from our latest STADIUM TECH REPORT, an in-depth look at successful deployments of stadium technology. Included with this report is a profile of a new MatSing ball DAS deployment at Amalie Arena, a new under-seat DAS deployment for the San Francisco Giants at AT&T Park, and a look at the new DAS at Wrigley Field! DOWNLOAD YOUR FREE COPY now! No doubt where you are at. Welcome to LA… FC. 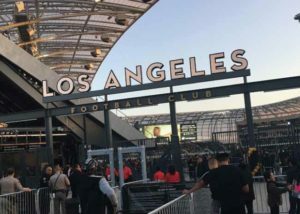 The foundation for LAFC’s networking is a gigabit passive optical network (GPON) backbone with two chassis, plus fiber links from two service providers, AT&T and Crown Castle. The stadium backbone is 10-Gbps fiber with 100-Gbps dark fiber in place, Lau explained. LAFC is one of just a few sporting venues using GPON, along with Mercedes-Benz Stadium in Atlanta, and Texas A&M’s Kyle Field in College Station. Perhaps not coincidentally, the technology contractor for all three projects was IBM. Wi-Fi was an obvious requirement for BofC Stadium; back-of-the-house networks support ticketing processes at the gates, along with POS applications and LAFC administrative needs. Fan-facing Wi-Fi (“LAFC Guest”) blankets the venue with 487 access points; Lau’s leaving open the door to add more APs as requirements dictate. 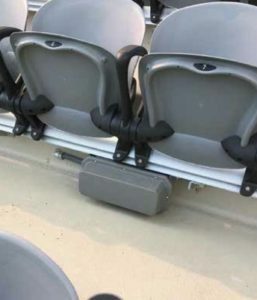 About 60 percent of the existing APs are installed under seats in the stands. Ruckus Networks is the Wi-Fi AP vendor and helped with system engineering and tuning. While engineered for 70,000 users, the venue’s Wi-Fi has been averaging about 8,700 simultaneous users, according to Lau. The LAFC Guest network has no landing page since at some venues, loading times for landing pages can be long, leading to frustrated users abandoning the Wi-Fi. Users have also come to consider Wi-Fi a de facto amenity, so LAFC wanted to ensure its guest Wi-Fi network was easily and quickly accessible, Lau said. 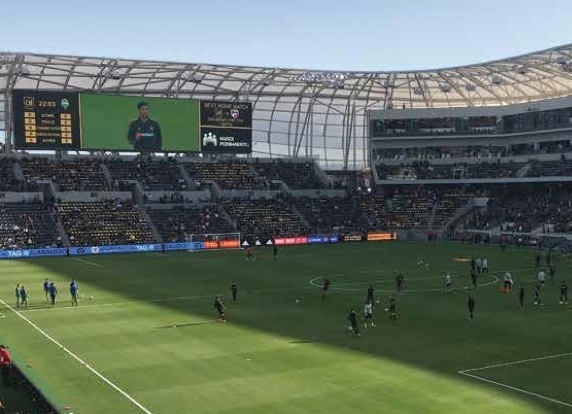 On the cellular side, LAFC called on wireless services and engineering firm Mobilitie to pull together the distributed antenna system (DAS) for BofC Stadium. The venue’s DAS network consists of 25 zones powered by Ericsson gear; there are 160 antennas and over 7 miles of cabling to handle nearly 1.5 million square feet of DAS coverage. All four of the major wireless carriers — AT&T, Verizon, T-Mobile and Sprint – have signed up for BofC’s DAS network. 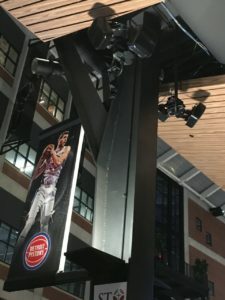 Verizon was on air for the first game; Sprint was scheduled to fully integrate into the DAS network by the end of June, according to Stephanie Gray, senior director, wireless coverage solutions for Mobilitie. 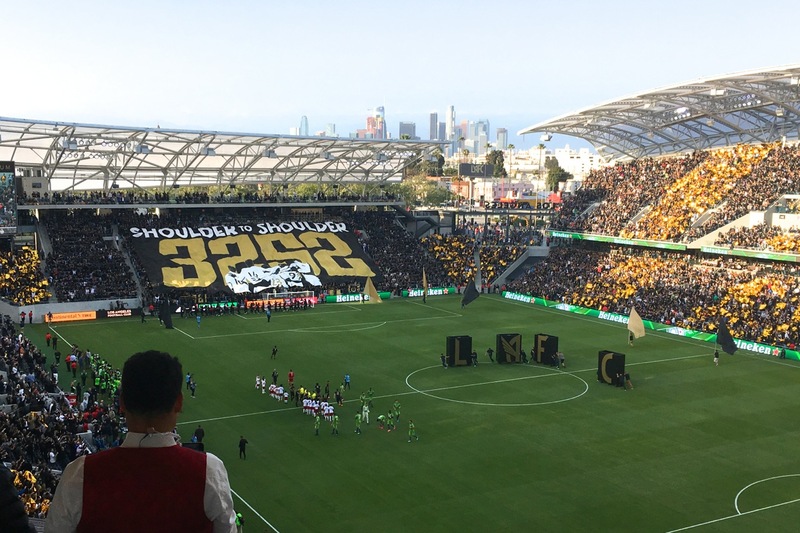 LAFC was looking something transformative in its use of technology that would set BofC stadium apart from other stadiums, Gray told Mobile Sports Report. 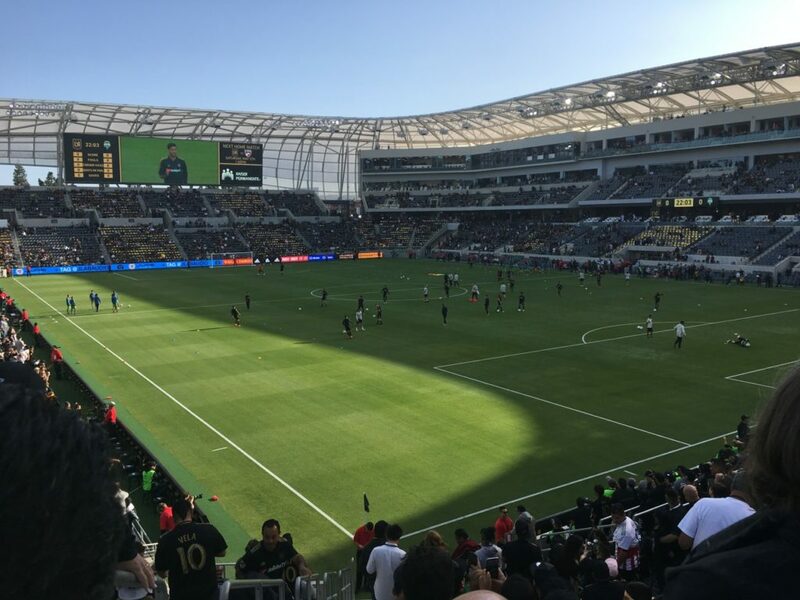 LAFC wanted seamless wireless especially in transition zones, part of strict requirements for the DAS network. Mobilitie brought engineering know-how to deal with the inevitable onsite quirks unique to every venue. In the case of BofC Stadium, the overall design aesthetic is modern and slick. 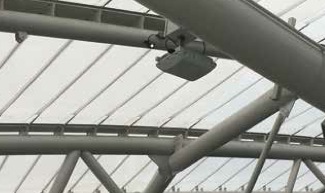 The ceiling materials in many parts of the stadium – clubs, suites and some concession areas — are sheathed in metal, which presents an RF propagation challenge for RF, reducing signal strength. On-field DAS coverage was also challenging, according to Jamie Witherspoon, director, technical solutions, for Mobilitie. Antennas had to be mounted on stadium trusses before the trusses were craned into place, an unusual technical cart-before-the-horse process. The reason? Cherry-picker equipment couldn’t be on the field or its freshly laid sod to adjust DAS antennas. In addition, Witherspoon reported lots of negotiations with the architecture firm, Gensler, to ensure the DAS antennas were as unobtrusive as possible and to preserve the stadium’s design aesthetic. 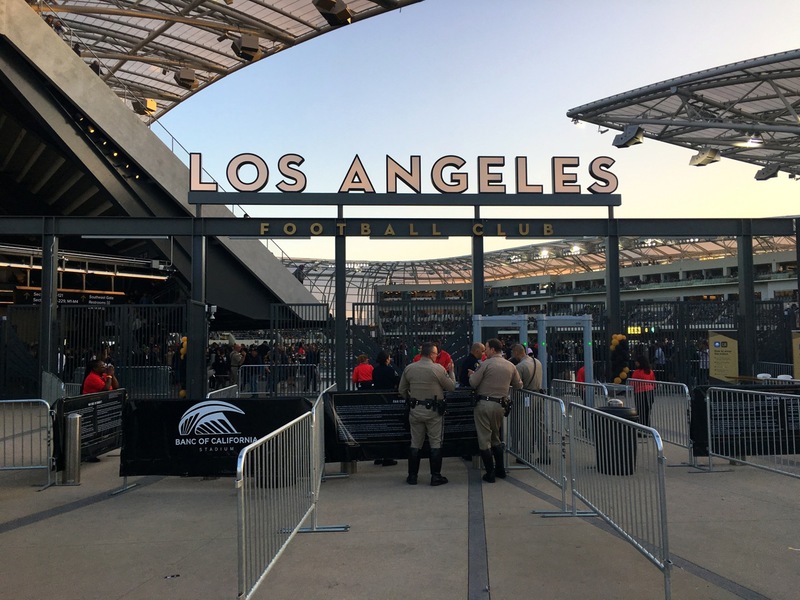 Mobile Sports Report put the fan-facing Wi-Fi and DAS to the test at BofC Stadium’s opening day, a match between LAFC and the Seattle Sounders. We sampled upload and download speeds around the stadium using the Speedtest app to measure performance. All our tests are only from Verizon’s services inside the venue. In general, the BofC wireless services appear well engineered and cover the stadium’s common areas effectively. As to be expected, bandwidth performance was higher in the areas around the suites and clubs, where Wi-Fi downloads clocked in anywhere from 12.38 Mbps in the Sunset Loge on the west side of the stadium to 15.26 Mbps in the Founder’s Club. Wi-Fi upload speeds came in at 63.92 Mbps and 71.94 Mbps, respectively, the highest speeds measured in our tests at BofC Stadium. Verizon’s DAS wasn’t as fast as the guest Wi-Fi. Highest DAS download speed at the south concessions was 37.67 Mbps; Section 123 on the southern side of the bowl came in at 35.43 Mbps. Highest upload speed for DAS service was 21.42 Mbps in the southeast concession area, followed by 20.92 Mbps around the southwest concessions. A couple areas were less robust from a wireless bandwidth perspective. The DAS performance in the concession area outside the Figueroa Club on the east side of the stadium measured 9.4 Mbps download/10.97 Mbps upload; guest Wi-Fi in the west concessions area came in at 8.58 Mbps/1.93 Mbps, while Wi-Fi in the south concession wasn’t much better at 8.27 Mbps/1.98 Mbps. But generally, the guest Wi-Fi outperformed Verizon’s DAS and most Wi-Fi download/upload speeds were in the double-digits of megabits per second. LAFC worked with mobile integrator Venuetize to build out the team’s app, using the MLS team app template as its foundation. 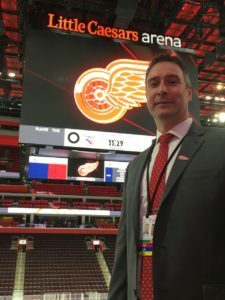 As a new team and one that started its season with a succession of away games, there was no reason to have stadium-based features in the app’s first iteration, said Lou Fontana, vice president of project management for Venuetize. The earliest iteration of the LAFC app concentrated more on content pieces, followed by the BofC Stadium-specific features. LAFC’s app features both mobile ticketing and a sophisticated digital wallet for making onsite purchases for food or team merchandise. 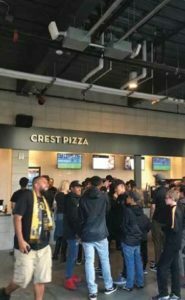 LAFC’s Lau volunteered that the organization is looking to have totally digital ticketing by 2019 – no paper, no PDFs to print out. Venuetize did some backend integration with payment processing partner Vantive; the ticketing part of the app works with ticket marketplace and aggregator SeatGeek. The LAFC app also uses and artificial intelligence-powered chatbot named Otto to help with stadium info, developed by Satis.fy. A future iteration of Otto will take it out of the Web’s view and make it a native view, incorporating elastic search. “That will enable fans to ask about players and the team schedule, and will replace search function in the app,” Fontana said, adding the upgrade could come sometime this summer. The current version of the app has video, served up from MLS’s site. Immediate replay is something Venuetize will work on with LAFC. “When is the video content source available? That’s an issue,” Fontana said, adding that scoring plays make it out of the MLS server within about 25 minutes. While Venuetize could take that content and make it native, it’s not a top priority for the team at the moment. BofC Stadium has installed Bluetooth beacon technology. 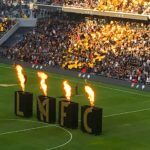 “We haven’t gone through process of dialing in beacons, but wayfinding and navigation are on the list” for the LAFC app, Fontana said. The integrator is also looking at GameChanger MVP, an augmented reality game developer, for a scoreboard game to fold in. “AR gaming will be the next interesting thing” for sports apps generally, according to Fontana. First you heard the booming bass of drums, then came the chanting of thousands (“FC!…LA!…FC!”). 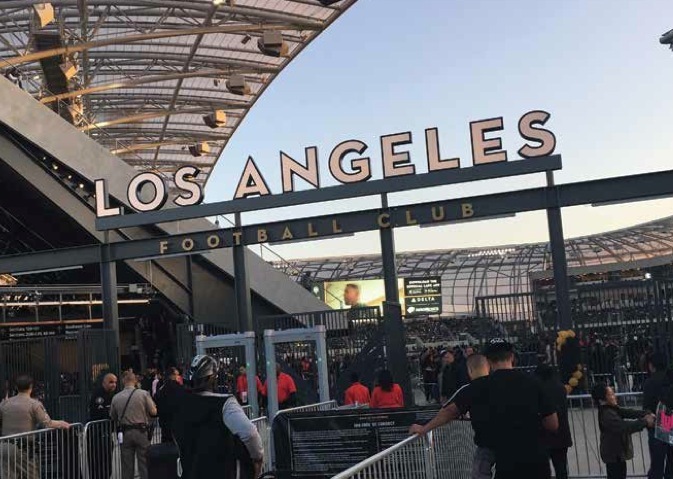 You may not see the Banc of California Stadium at first, but this aural GPS guides fans toward Major League Soccer’s newest venue, which opened April 29 with expansion team Los Angeles Football Club. With a final price tag of $350 million (~$100 million over its original budget), the stadium is the most expensive for a soccer-specific venue. First things first: The Ruckus-based Wi-Fi and its 500 access points functioned beautifully, as did the DAS network that Mobilitie helped engineer – more on that in our upcoming summer STADIUM TECH REPORT issue next month. 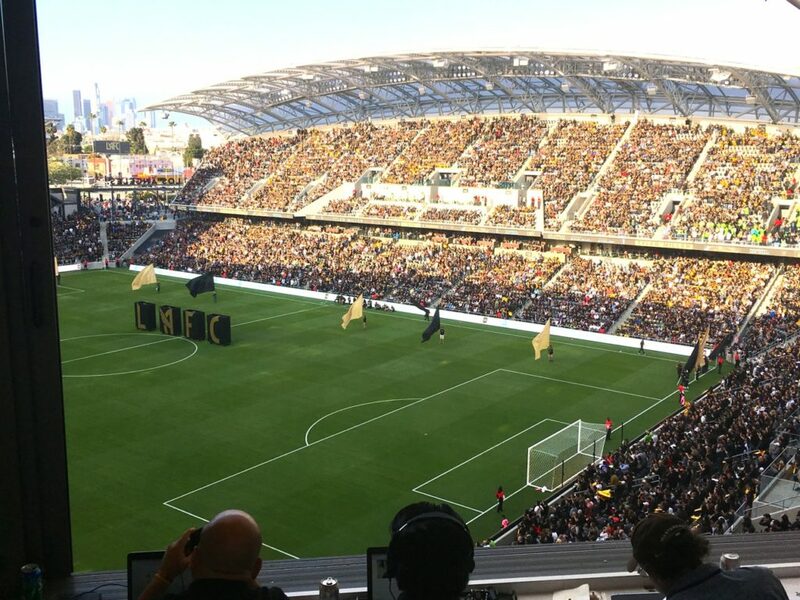 The freshly minted wireless infrastructure ensured attendees on opening day could Instagram the U.S. Navy paratroopers landing center field, trailing colored smoke out of their heels (black and yellow/gold, LAFC’s colors, of course). Or the surprise appearance of comedian Will Ferrell (who also owns part of LAFC), balancing a hooded bird of prey on his wrist. Olly, LAFC’s mascot, then hopped to the arm of its usual handler who released the falcon, thrilling the crowd with its gliding and swooping, completely unfazed by 22,000 fans and their cheers. But for sheer endurance, raucous fans in the north stands put on the biggest show, beating drums, waving flags (Brazil, Argentina, Portugal, to name a few), and singing fight songs. The drummers kept things lively throughout the game, even if they were occasionally obscured by the yellow/gold smoke bombs set off at strategic moments. 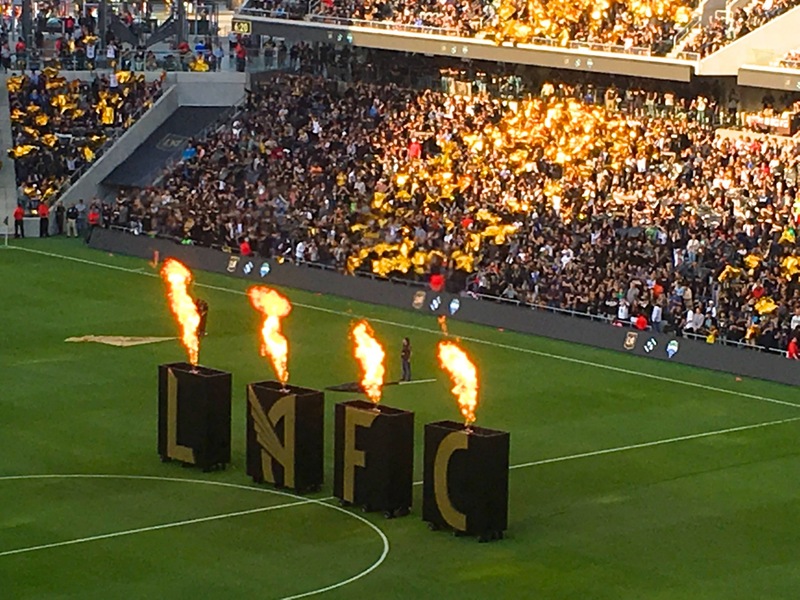 A blazing open to the LAFC’s new home. At regular intervals throughout the inaugural game against the Seattle Sounders, the feeling was less southern California and more like one of South America’s soccer stadiums. The stadium is well named, if only because it has the sound and spirit of a giant cash register. Multiple establishments – Founders Club, Sunset Deck, Field Level Club, Figueroa Club, Directors Lounge – ensure no one goes hungry or thirsty. Luxury suites fill in the gaps. Down on the main level, LA’s tastiest eateries (tacos, barbecue, Korean, shawarma, coffee, craft beers) have outlets and the lines were long on opening day. There are also the obligatory team merchandise and souvenir stands and season ticket vendors. Making money is one goal for LAFC, but so is winning games. LAFC triumphed in its debut home game 1-0, thanks to a free kick by team captain Laurent Ciman. That’s an auspicious start for MLS’s newest franchise and its shiny newest stadium.